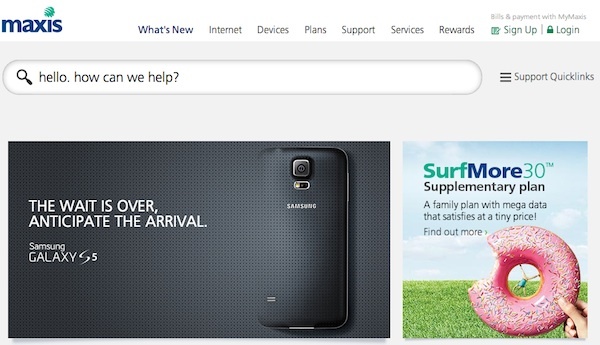 To all of you who are waiting for the arrival of the Samsung Galaxy S5 to Malaysia, your wait is over…according to a Maxis teaser on its main page. Maxis has just posted a teaser that reads “the wait is over, anticipate the arrival”. Unfortunately, it’s not a call for a registration of interest, it doesn’t provide any details at all about the device, date of arrival or retail price, but with 3 telcos teasing the device, the launch date might be really soon. In case you missed it, DiGi has already started its registration of interest for the device while Celcom posted a similar teaser with absolutely no details at all. The Samsung Galaxy S5 was announced just last month at Samsung’s Unpack event in MWC 2014. The latest flagship smartphone from Samsung is powered by a 2.5GHz quad-core Snapdragon 801 processor with 2GB of RAM on board. It features a 5.1” Full HD Super AMOLED display, 16MP rear camera, a revamped TouchWiz UI, supports Cat4 LTE, has a fingerprint and heart-rate sensor on board, and comes in a water- and dust-resistant build rated at IP67. Find out more about the device in our previous post or check out our hands on and first impression post while you’re patiently waiting for its arrival.